In this jazz guitar lesson we are going to give you some common voicings for some major 7th, minor 7th and dominant 7th chords. 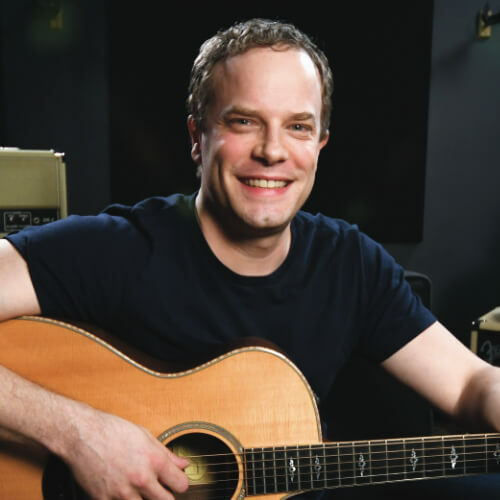 All of the chords in this lesson will have their root notes on either the D note on the 5th fret of the 5th string or the A note on the 5th fret of the 6th strings. Don’t worry about how the chords are made right now, just concentrate on memorizing the shapes. We have provided you with chord diagrams for each chord presented in this lesson. Once you get these shapes memorized, check out the lessons on the 251 Jazz Chord Progression and the 36251 Jazz Chord Progression. Let’s start with the shapes for the major 7th chord shapes. The root note for the first shape is A note on the 5th fret of the 6th string. Put your 1st finger on the 5th fret of the 6th string, 3rd finger on the 6th fret of the 4th string, 4th finger on the 6th fret of the 3rd string and 2nd finger on the 5th fret of the 2nd string. Play those four notes. You might want to mute the 5th string by letting your 1st finger lay over it a bit. The root of the next chord is a D note on the 5th fret of the 5th string. Place your 1st finger on the 5th fret of the 5th string, 3rd finger on the 7th fret of the 4th string, 3rd finger on the 6th fret of the 3rd string, and 4th finger on the 7th fret of the 2nd string. Strum those four notes. If you want, you can bar the 5th fret with your 1st finger and include the 5th fret of the 1st string in this chord shape. Time to move on to a couple of minor 7th guitar chord shapes. Make a bar across all six strings on the 5th fret with your 1st finger. To finish this shape, place your 3rd finger on the 7th fret of the 5th string. Strum all six strings. The root for second minor 7th chord shape is a D note located on the 5th fret of the 5th string. Make a bar across the top 5 strings on the 5th fret with you 1st finger. Now play the 7th fret of the 4th string with your 3rd finger and the 6th fret of the 2nd string with your 2nd finger. Play all of the strings except for the 6th string. The last type of chord thats we will learn some shapes for is the dominant 7th chord. Make a bar across all six strings with your 1st finger on the 5th fret. Now place your 3rd finger on the 7th fret of the 5th string and 2nd finger on the 6th fret of the 3rd string. Play all six strings. To play the next shape, bar the top five strings on the 5th fret with your 1st finger. Add your 3rd finger to the 7th fret of the 4th string and 4th finger to the 7th fret of the 2nd string. All of these chord shapes are used quite often in jazz and other types of music. Get these shapes under your fingers and then go check out some of the other jazz lessons. 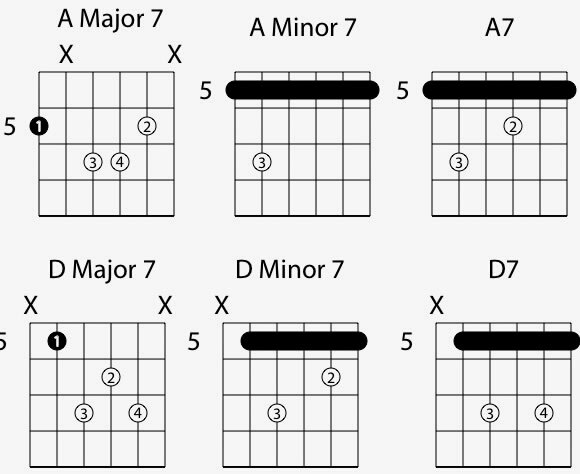 Learn how to read chord diagrams, sheet music, and guitar tabs here.